Christophe Fratin (1801 - 1864) was born in Metz, France on January 1st 1801, the son of a taxidermist. 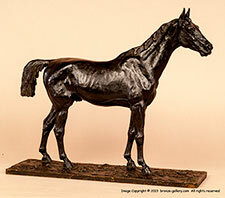 Fratin was a highly competent artist and one of the first of the French sculptors, along with Antoine Louis Barye, to successfully portray animals in bronze. 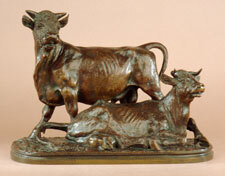 His understanding of animal anatomy as well as their natural actions and poses gives his bronzes a life like realism. Most of his animal subjects appear gaunt with pronounced rib cages which is what they would have look like in their natural environment as opposed to the well fed zoo animals that were modeled by so many artists. Fratin's true understanding of animal anatomy and form came from his early experiences helping his father with his taxidermy business. Fratin first studied sculpture under Pioche in Metz but became disillusioned with the romantic style of the day and moved to Paris where he studied under the painter and sculptor Gericault. 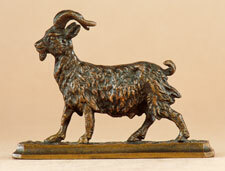 Fratin's animal bronzes were very popular in most European countries as well as America and England during his lifetime. Some of his most favored and collected sculptures are his numerous dancing bears, and dressed animals which are engaged in human activities. Fratin's work was highly romantic in its interpretation without the dramatic and sometimes violent treatment that Barye so successfully portrayed. Fratin executed may wild and domestic animal groups always capturing his subjects in their normal activities such as eating or in flight or motion with their flowing manes and tails. His ability to capture an animal in full flight, or at the exact moment of it's being caught by a predator was unmatched by any artist before or since his time. 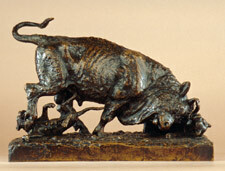 Like Barye, several of Fratin's works were refused entry to the Paris Salons in the late 1830s. The juries in charge of entries during that time did not consider this new form of animal sculpture to be worthy subjects for consideration as art. It is not know if this was the reason why Fratin did not exhibit his works at the Salons for the years 1844-1850, but Fratin and Barye both started exhibiting again in 1851. Fratin received several monumental commissions in France as well as other countries, one of which was the Deux Aigles Gardant Leur Proie which is located in New York's Central Park. 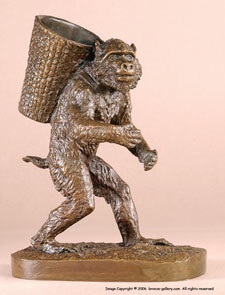 He cast many of his small bronzes for commercial sales during his lifetime. 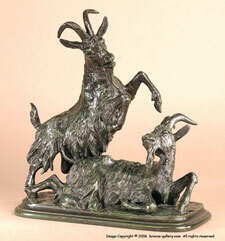 Being an early Animalier sculptor his works were cast by many foundries throughout his lifetime. Fratin worked very closely with the Paris foundries which produced his bronzes and many of his casts bear his personal stamp which has the "N" in his name reversed. His bronzes were cast by Susse Freres in the 1830s, then by Quesnel until 1847 and finally by Daubire and those examples usually bear their foundry marks and seals. Toward the end of his life in March of 1857 he held an auction of seventy terra cotta models which were purchased by several foundries. Fratin exhibited at the Paris Salon in the years: 1831-1842 and 1850-1862. He also exhibited at the Great Exhibition in London in 1851. Fratin was active in 46 exhibits of his works during his lifetime. The Eisler Collection, Vienna, Austria.